TheMetalBikini.com- X-Wing Miniatures and more: Another Scum and Villainy Reveal! 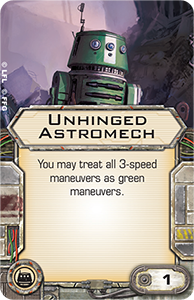 So yesterday, FFG revealed some more info on the Scum and Villainy faction concerning the upgrades that are exclusive to these dudes: the Salvaged Astromechs and the Illicit upgrades. If you ever played the West End Games Star Wars RPGs or even the newer FFG ones, you'll know that much like in real life, there's a whole lot of fun stuff that's illegal in the Star Wars universe. Guns, drugs, awesome tech- you name it. I mean, Han Solo wasn't smuggling toys for underprivileged kids when he had to jettison his cargo, amirite? FFG mentions that not everyone that's Scummy or Villainous gets to use them though- Y-Wings don't have it nor do the SCYK, and apparently the StarViper only gets it through the Virago Title, which is kind of a roundabout way of saying that only the IG-2000 and the Z-95 get to take advantage of the Illicit upgrade. Oh, well, and the Firespray, or at least the Fett version of the Firespray. Not sure about the S&V HWK. I can't squint hard enough to tell. 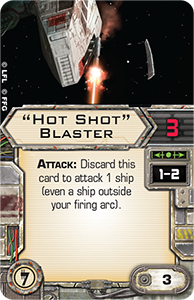 The first Illicit upgrade revealed is the "Hot Shot Blaster", which if that doesn't give you a good enough excuse to start talking like Dennis Hopper in Speed, I don't know what will. So this card is kind of interesting in that it seems to qualify as a Secondary Weapon System since it has the "ATTACK: such and such" writing on the card that would also qualify for Munitions Failsafe because it's a "Discard this card to attack" kind of thing, which frankly seems just weird to me. Weird enough for me to think I'm completely wrong about this entire paragraph. If so, I'm sure y'all will correct a brotha. In any case, it's kind of an odd card as it seems a little overcosted for what it does, but what do I know? I guess it could be handy if you stuck it on a Z because you really wanted that extra Attack die if a great opportunity presented itself, or you don't have the points to attach something like a Heavy Laser Cannon to your Firespray or you want a single use turret kind of thing. I'm curious to see if this card dovetails with something else that'll be revealed later, because I sorta don't get it right now. 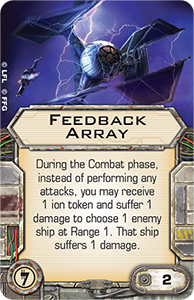 Feedback Array is another Illicit upgrade revealed yesterday, but it's not a Secondary Weapon type thing, which makes me think that Illicit stuff is going to kind of be a grab bag of upgrades that don't really conform to a given "type" or "genre" or whatever the way the current upgrades more or less do. As for what it does, it's a sin eater kind of thing where the ship bearing this upgrade can decide to get an ion and suffers 1 Damage to make an enemy ship at Range 1 also suffer 1 Damage rather than performing a normal Attack. Two things jump out at me when I read this card. First, is the whole "Suffer Damage" thing. I've talked about this before on here, but if something makes a ship "Suffer Damage", the long story short version is this: while the ship can't try to avoid the damage by rolling green dice or using an Evade token, if the ship has shields, then the damage is applied to the shields as normal. The point is, it doesn't say, "Dealt a Damage Card", so shielding would still be in play. It also wouldn't take out a Stealth Device as the ship wasn't actually "Hit." The second thing that jumps out at me is the seemingly odd wording there at the start of the card. You'll notice that this card is not an Attack, it's some stuff that happens instead of an Attack. The reason I bring this up is I think somebody could make a pretty strong debate for this card still working even if the bearer is on top of an Obstacle. If you read The Rules regarding Attacking and Obstacles, you'll find that "... during the Combat Phase (any ship overlapping an obstacle) cannot attack any other ship." Of course, that may be how FFG intended it to work all along, in which case a debate would be kinda pointless, but whatever. You get my drift. So here's another non-Attack, Damage dealing Illicit card. This time though, it's when the ship bearing this upgrade is destroyed, it dings everybody at Range 1 with some more "Suffer Damage." Hard to say how attractive this is in context without knowing the rest of the Illicit cards, but for relatively low-cost ships like Zs and HWKs, you gotta think somebody's going to try a kamikaze list with stuff like this at some point. I don't think that any of the S&V ships can take multiple Illicit upgrades, but man this would be a real pain coupled up with that Feedback Array I just mentioned, huh? 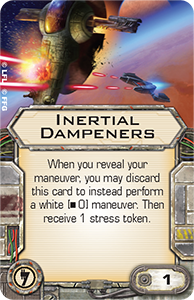 Inertial Dampeners, aside from sounding like a fancy name for a seatbelt, further reinforces the notion that Illicit upgrades are a potpourri of random upgrades rather than an organized set. It triggers when you reveal a Maneuver, so no using it after you've been Ionized, and you discard it to instead perform a stationary. Unlike the Shuttle's stationary move, this one is white instead of red, but then says you get a Stress Token. At a glance, there's no real difference, but the thing here is that if you just pulled a K-Turn or should I say a Segnor's Loop the turn before, your opponent doesn't get to pick your maneuver because you just pulled two reds in a row. Also note the lack of "You can't pull this if you've already got a Stress Token" verbiage we're used to seeing on cards like this. I don't know if any of the S&V pilots or other upgrades will benefit from having a Stress Token, but this would be another way to invoke it if necessary. It'd also be handy if you'd totally guessed wrong about your maneuver in relation to your opponent's or if you just straight up picked the wrong maneuver by accident. 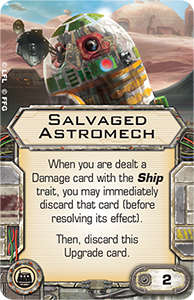 The titular (huh, huh, huh) Salvaged Astromech is a two-pointer that lets you discard a dealt Damage card with the Ship trait. As the majority of the cards in the Damage deck are actually Ship cards, this isn't such a bad deal. Admittedly, it's a one-shot kind of deal, but with Salvaged Astromech being a "You may" rather than an automatic trigger, you can kinda wait and see if you want to just let the Damage happen or if you want to discard it along with SA which is nice. First, I like that this Droid is named Genius, but it's in quotes like it's an ironic nickname rather than a true description, y'know? 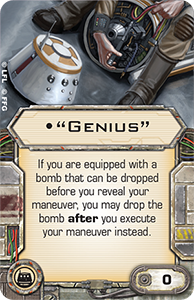 So "Genius" allows a Bomb-toting Y-Wing (yeah, that can happen now- more on that in a sec) to drop Bomb after you execute your Maneuver rather than before, which is of course, usually the case. Yeah, you're probably going to get hit with some Damage, but you're flying a Y-Wing. It's not like you can't take it, right? Well, probably. Unhinged Astromech is the last revealed Salvaged Astromech, and in this case, they seem to have saved the best for last. Rebel Y-Wings, and one would assume to at least a certain extent the S&V versions as well, aren't the most maneuverable of ships. For one measly, stinkin' point, this guy changes that pretty significantly by making all the 3-speed Y-Wing Maneuvers count as Green Maneuvers. How big of a deal is it, you might ask? Well, I popped over to (Yet Another) and pulled up the Rebel version so I could see the available maneuvers. Now, again, we've no guarantee that the S&V Y-Wing will have the same dial as the Rebel version, but if it does? Wow. 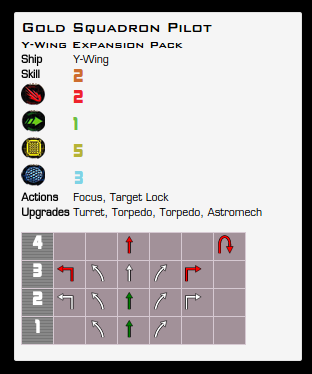 Suddenly Y-Wings have 7 Green Maneuvers! 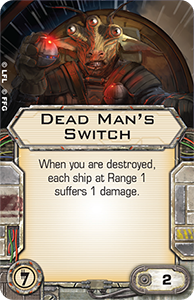 There were a couple of other cards revealed in the FFG article as well. 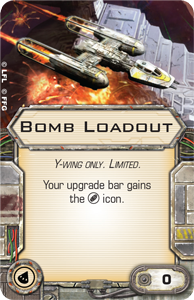 So for 0 points, your Y-Wing can now haul Bombs. The only real downside here is you use up one of your Torpedo tubes to do it, which may or may not be that big of a deal depending on how different the S&V Y-Wing pilots are compared to the Rebels and how you feel about ordnance in general. It being "Limited" you'll recall means that you can only use one instance of it per ship, so no, you can't take it twice and fill both tubes with Bombs. 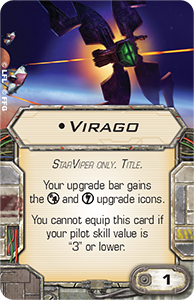 The Virago Title for the StarViper was also revealed. Assuming your SV pilot is PS 4 or higher (again- no real idea what the significance of that is without knowing the cost of the pilots), he can spend a point to take the title and unlock Illicit upgrades as well as Advanced Systems. Hard to say how big of a deal this is at this point with so much still being unknown, but it seems like a pretty reasonable payoff if for no other reason than to sport the always handy Advanced Sensors. 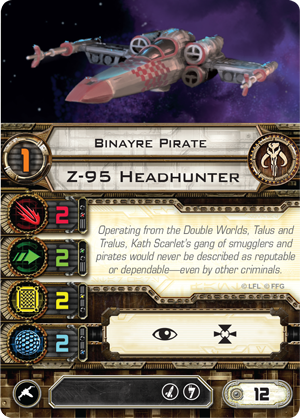 Binayre Pirate is basically the S&V Bandit Squadron pilot and he looks much the same as his Rebel counterpart save for the Illicit upgrade slot, one less PS, and the sweet checkered paintjob on his card art. The last card revealed (at least I think it's the last one- Christ! I gotta get to bed here at some point!) 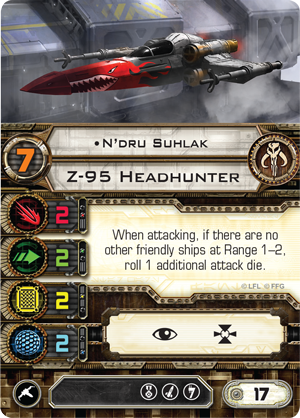 is a named Z-95 pilot for the S&V called N'Dru Suhlak. As you'd expect, his stats are the same as a standard Z-95 pilot, but he costs 17 points, is PS 7, and has access to Elite Pilot Talents. Well, that and some sweet card text that says if he's lone wolffin' it, he gets an extra Attack die. Cost-wise, he's the same as Blount, and has the same upgrade options, but has one more PS and access to the Illicit upgrade, which kinda makes you wonder if he's not maybe a point undercosted. Suhlak, I mean. I mean, yeah, Blount has the auto-hit regardless of damage thing, but Suhlak has a pretty nice card text ability too. Anyway, pretty interesting stuff all around!